Hillsboro’s Reece Bloomfield blows by a Miami Trace defender after a terrific ball fake on Friday at Hillsboro High School where the Indians hosted the Panthers in FAC varsity boys basketball action. The Hillsboro Indians won their third consecutive game on Friday night when they hosted Frontier Athletic Conference rivals the Miami Trace Panthers in a close 42-38 home win. The Indians trailed 22-19 at halftime but outscored the Panthers 23-16 in the second half to pick up the hard fought victory. The highlight of the night came in the fourth quarter when Hillsboro senior Reece Bloomfield used a terrific ball fake to get Miami Trace’s Logan Rodgers looking the opposite direction and drove to the basket for a layup to put the Indians up 37-31 as the pro Hillsboro crowd erupted. Bloomfield then split a pair a free throws to extend the Hillsboro lead to 38-31 with 5:33 to play. Miami Trace answered with an offensive rebound and put back by Austin Brown before Ethan Steele hit his second three pointer of the game to get the Panthers within two points at 38-36. On the next Miami Trace possession Hillsboro’s Ryan Scott took a charge against the Panthers’ Kyler Conn to halt the visiting team’s momentum. The Indians then went to a stall offense that saw them milk nearly three whole minutes off the clock before Mason Swayne was able to convert in the lane and push the Hillsboro lead to four points with the scoreboard reading 40-36 and 1:33 to play. After a defensive stop by the Indians Scott hit a mid range jumper from the left corner to make it 42-36 with 38.5 second to play. The Panthers’ Brown recorded the final points of the game with 31.3 to play to provide the final score of 42-38. Miami Trace tried to extend the game by fouling late but, the Indians were not put into a one and one bonus until there was less than 16 seconds to play because the Panthers had committed few fouls to that point. The Indians started the game with a 7-0 run as Swayne opened the game with a three pointer and Watson scored twice at the rim before the Panthers’ Cameron Moore hit two free throws at the 4:23 mark of the first. Hillsboro extended its lead to 10-2 before Miami Trace found its footing and finished the quarter with an 8-2 run to make it 12-10 in favor of the Indians after the first quarter. The Panthers outscored Hillsboro 12-7 in the second quarter when Dylan Bernard had five points including a three pointer with 2:50 to play in the half that tied the game at 17. Miami Trace took the lead on a three pointer by Steele with 34 seconds left in the second quarter and the Panthers led 22-19 at halftime. Watson and Swayne each had baskets early in the third quarter to push the Indians back in front at 23-22 with 7:38 to play in the third. Kyler Conn scored a short time later to put the Panthers back on top for the last time at 24-23 with 6:04 left in the third quarter of play. 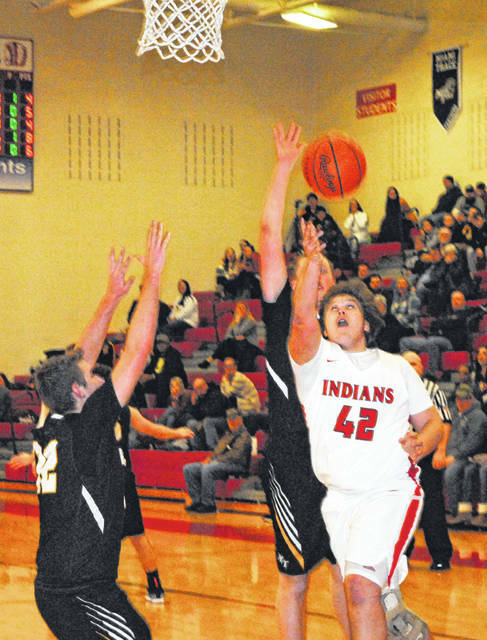 Swayne putt Hillsboro back on top for good when he hit a three pointer a minute later and followed it up with another basket in the lane and brought the score to 28-24 in favor of the Indians. Moore got one to fall for the Panthers and Brad Miller, of Hillsboro, recorded his only two points of the night on a nice post move before Brown grabbed an offensive board and put it right back up and in to make the score 30-28 in favor of the Indians. A technical foul on Miller as he subbed out of the game gave Austin Matthews a chance to tie the game but he missed both and then Brown missed consecutive free throws with 56.6 seconds to play in the third before Gavin Temple hit a three pointer for the Indians that gave them a 33-28 lead and set up the wild fourth quarter finish. Hillsboro will be back in action on Tuesday, January 29, when they host the Goshen Warriors in a non-conference matchup. The Panther will be back on the court Saturday when they travel to Waverly to take on the Tigers in non-conference action.